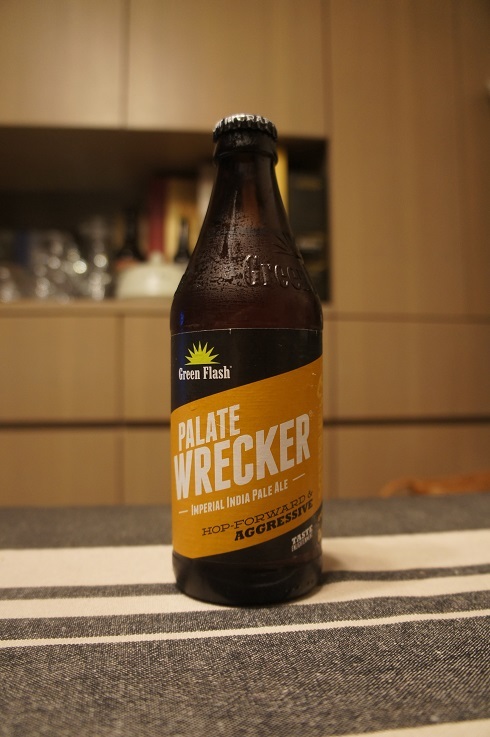 Category Archives: Green Flash Brewing Co. Brewer Description: (from bottle) Our heavy hitter. 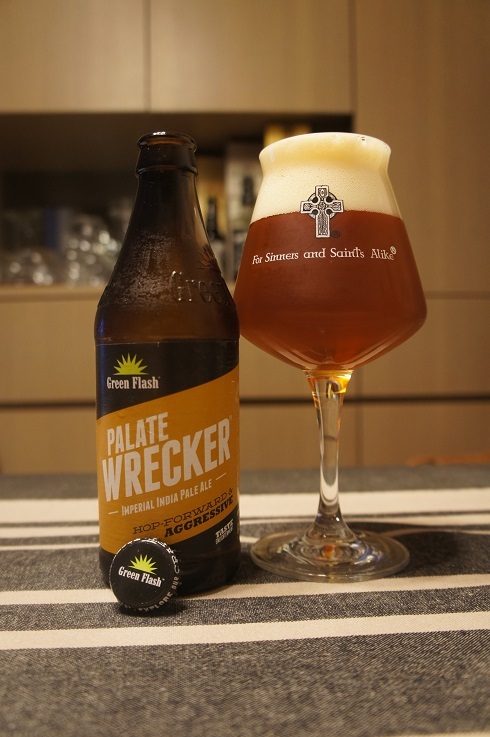 Weighing in at six pounds of hops per barrel, Palate Wrecker stands up to the hoppiest heavyweight in the ring. A complex double-brewing process of mashing and sparging with hopped wort and special hop layering techniques used during a hop crisis define this champion. An abundance of Centennial, Columbus and Simcoe hops challenge and stun hop heads with an aggressive hop-forward attack. Your palate will recover, but you will remember that last round forever. Intro: A 12 fl oz bottle with a best before date of 8th August 2017. Poured into a Lost Abbey teku glass. Appearance: A very nice clear copper amber colour with a two finger off white head that had great retention and left lots of nice sticky lacing. Aroma: Earthy, piney with citrus mandarin, sweet candied orange and hints of caramel malt. Taste: Strong bitterness, lots of citrus rind, and whenever they can get through the bitterness, there’s some pine, orange, grapefruit, citrus peel with hints of bready malt and caramel. Overall: It was nice but this definitely was a palate wrecker. A whole lot of bitterness, which I can certainly enjoy every now and then, but not too often. 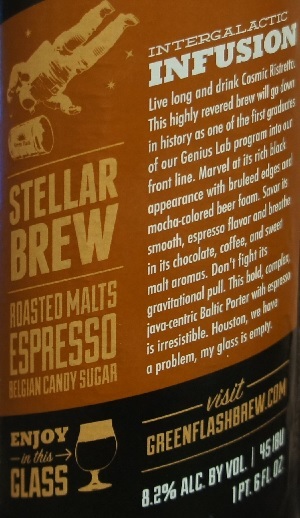 Brewer Description: (from bottle) Intergalactic infusion. 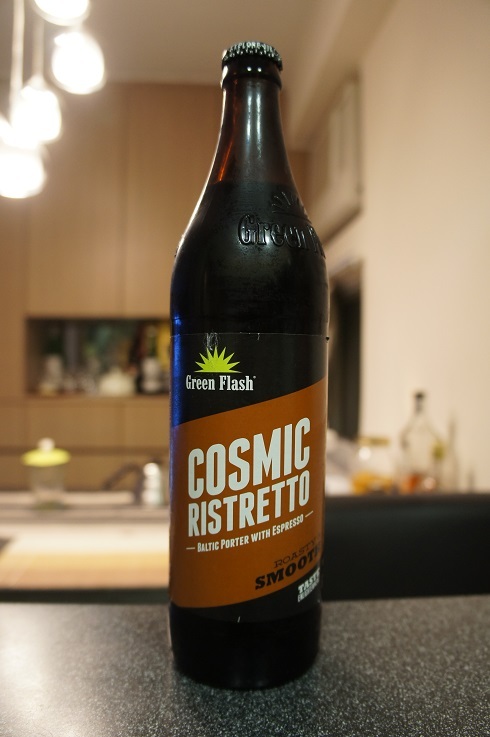 Live long and drink Cosmic Ristretto. This highly revered brew will go down in history as one of the first graduates of our Genius Lab program into our front line. Marvel at its rich black appearance with bruleed edges and mocha-colored beer foam. 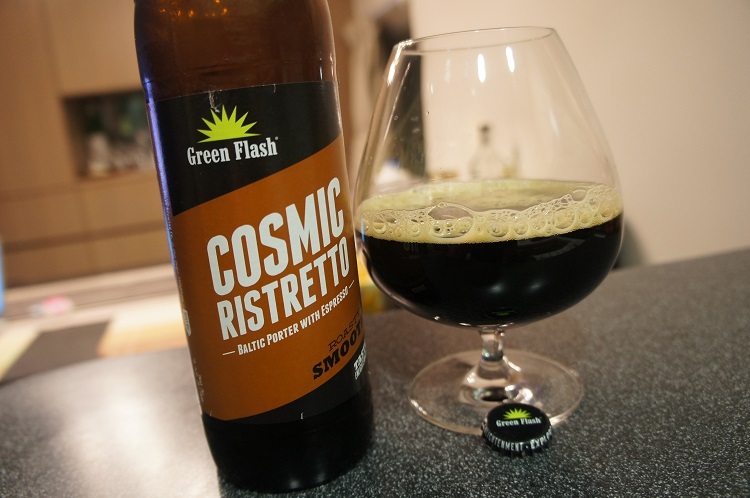 Savor its smooth, espresso flavor and breathe in its chocolate, coffee, and sweet malt aromas. Don’t fight its gravitational pull. 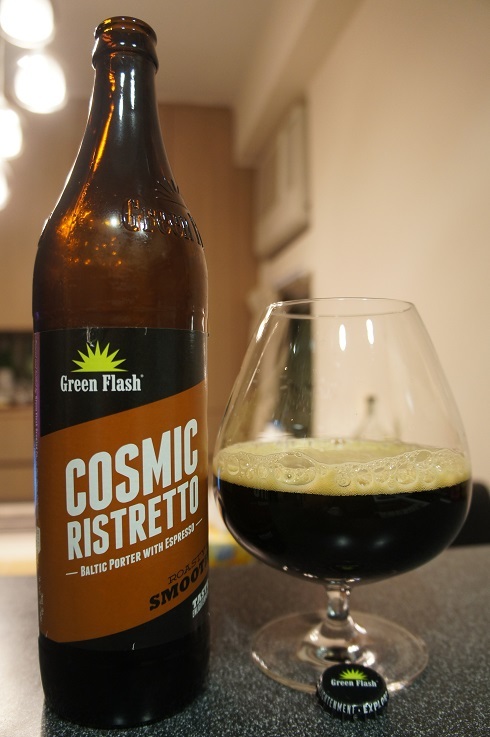 This bold, complex, java-centric Baltic Porter with espresso is irresistible. Houston, we have a problem, my glass is empty. Intro: A 22 fl oz bottle with a best by date of 10th August 2016 and poured into a snifter glass. Appearance: It poured a clear dark brown colour with a reddish hue and a one finger beige head that dissipated fairly quickly to a thin ring of lacing. Aroma: Dark fruits especially grape, bubblegum and roasty espresso with a hint of chocolate and vanilla. Taste: Lots of coffee and espresso with a light char. Hint of dark fruit sweetness, mostly grape, plum and prunes as well as a hint of bittersweet chocolate and vanilla. Overall: A solid Baltic Porter with nice coffee and espresso notes.